The Cassini spacecraft has taught us much about the tantalizing world that is Saturn’s moon Titan. The atmosphere is 50 percent thicker than Earth’s and contains methane clouds, which dump their loads in monsoon-like rainstorms. Titan’s atmospheric composition—mostly nitrogen and methane—resembles that of Earth’s atmosphere more than 4 billion years ago, at a time when life originated on our planet. Cassini has discovered huge ethane-methane lakes in the near-polar areas and dune fields in the equatorial regions. A relatively smooth landscape suggests that the moon is heated from the inside. Titan also probably has a subsurface ocean and groundwater consisting of a mixture of water and ammonia. There may even be geysers. Still, Titan is extremely cold. So, even with all these Earthlike traits, the question remains as to whether life could exist in a place that might be compared to an oil spill in Antarctica (except that it’s even more extreme). New research by Rainer Meckenstock and colleagues—including me—just published in the journal Science reveals that life can exist in a place on Earth that’s almost as nasty. 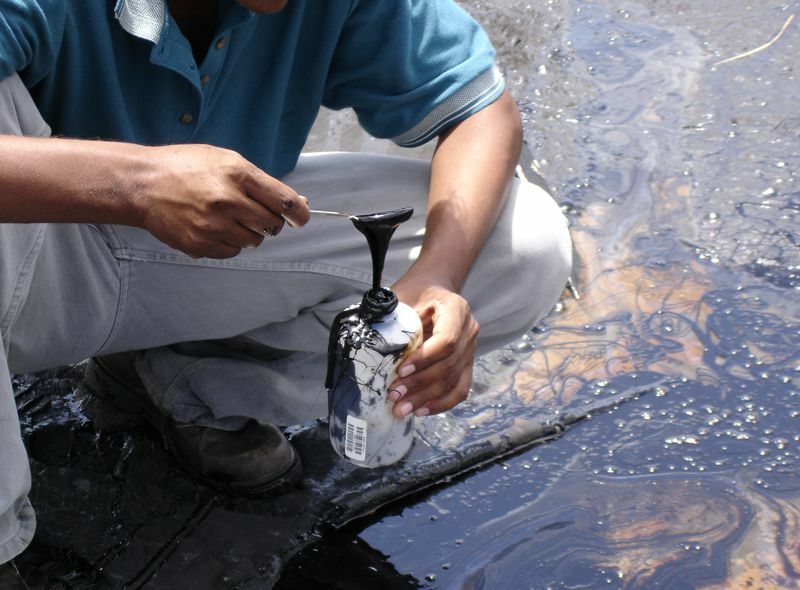 The international team analyzed a natural liquid asphalt lake in Trinidad and found that microbial life (bacteria and archaea) is concentrated in miniscule water droplets within the surrounding oil. The high salinity of the droplets and their isotopic composition indicates that the source of the hydrocarbons is the deep subsurface. As the oil rises from below, microbial activity changes its chemical composition, which manifests on the surface as an asphalt lake where methane bubbles are released into the atmosphere. The water content here is relatively low, and it had been generally assumed that there wasn’t enough water to sustain life. Astonishingly, water droplets dispersed in the oil matrix turn out to contain a rich and diverse microbial biota. The unexpected habitation of such an extreme environment, with little water and many toxic chemical compounds, shows again how adaptable life is. This discovery in particular shows one way that life can survive under extremely challenging conditions, not much different than the environment on Titan. The study also shows that the large surface area of these droplets represents a hitherto underestimated potential for biodegradation of oil—which may turn out to be very useful for cleaning up oil spills here on Earth.